I am a sucker for books about Colonial Africa. Out of Africa and West With the Night are books I reread, and reread again. 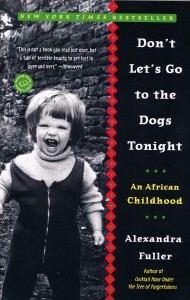 To this select collection I now add Alexandra Fuller’s account of growing up in Rhodesia (now Zimbabwe), Malawi, and Zambia. She has actually written two later books also framed by this experience, but this first account is by far my favorite. It starts with her as a young girl in 1976, going out to the loo at night with her sister holding a flashlight looking for snakes and baboon spiders. Hilarious, touching – a world vastly different from the one we knew growing up in the United States. Her childhood was unruly, often hilarious, sometimes violent, never boring. She grew up in a time of bloody revolution. The politics in Rhodesia were cruel as Mugabe took control and evicted their family from their farm. Her father, a displaced farmer with great skill tending land but no other trade, migrated from one inhospitable place to another in Central Africa. He and Fuller’s mother worked hard — and partied harder. Her mother, in many ways the real subject of the book, lost several young children to this harsh life, one infant drowning in a puddle while under his sister’s (the author’s) care. Fuller’s account of this African childhood is unsentimental, in your face – and yet joyful. She paints a picture of Central Africa that is vivid and beautiful, and also violent, illogical, and unforgiving. Her family finds laughter amid disaster, and always pushes on. The photograph of Fuller as a young girl in Rhodesia that graces the cover says more than any words can. This is a girl, and a family, that cannot be battered down.